Genesis to Jesus - for kids! This exciting musical and enchanced CD is designed to teach children a Bible overview. This enhanced CD also contains files that you can print out with the sheet music for the songs, together with a 10-session programme for teaching children aged 3-11 the whole Bible story. This great little resource therefore forms the basis of a Sunday School block of teaching, material for a holiday club, or for an after-school club. We bought this programme to use in a small Sunday school with varying numbers, ages and backgrounds of children. We feel it gives a good overview of the story of the Bible, with clear instructions and templates. The songs are also good to have for the different lessons. Overall, the children are enjoying it and we are glad to have tried it. 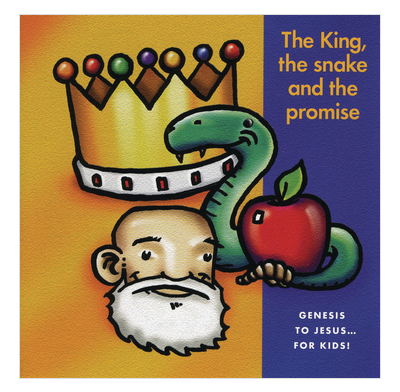 We have just completed 2 weeks of resources for The Bible in Ten Easy Lessons of which The King The Snake and The Promise CD are part of, which has everything you need to print off , patterns etc. for the banner and teaching material. The songs are excellent too very biblical and easy to learn also easy to print off for overhead projector. The children have been very attentive hearing the teaching and have enjoyed doing the banner and activities. Overall we think it is a very good teaching resource, our group are age 5 to 11 and it worked very well which such a wide age range even the 5 year old remembered Adam and Eve were not to eat from The Tree of The Knowledge Of Good And Evil. I would recommend it definitely. We are four weeks into using this material and are really enjoying it. Our Year 6s are making the banner, whilst the years 3 to 5 are making individual Bible overview books so that at the end of the ten weeks they'll all be taking home their own Bible overview. We have had to pad out the material a bit with games and craft, and also opportunities to get the children looking in the Bible for themselves. But overall I love the structure and the fact that they'll go away with the big picture. I wish I'd done this as a child! This resource offers so much for such a small price. The songs are enjoyable, memorable and full of the Bible's truth. The resource provides lesson plans as well as the templates to create a banner. The over view of the Bible it povides will prove a valuable teaching resource. I remain amazed at what good value for money this is. This is a really cheesy CD but we love it! Aussie narrator which seems odd at first. Our 10 month old loves it and we all sing along in the car! Will be a favourite for years to come. Great resource for bible lessons and to have as a CD for children to listen to without the lessons. All the children I know that have it love it, and so do the parents! This is a really enjoyable cd and the children can pick up the words and tunes easily. i bought this a few years ago at a Big Issue training event and had to replace it went it got lost. some really wonderful songs to use in sunday school and similar. We especially love 'clap your hands' and 'who is this man?'. Some really great bible teaching through song. Highly recommended. Also some good spoken links and bible passages which my own children enjoy in the car. What a fun and enjoyable way of learning about the Bible's message, with a banner to construct en route. The material is all there on the CD, songs connected with the major characters and themes, and teaching material with games and, as I mentioned that banner. 10 weeks material that should give teachers and young people a good grasp of what the Bible is about - which they knew already of course - it's about Jesus!